FEATURES • Work Management Provides continuous records of job status. Monitors work-flow and warns of overdue jobs. • Job History Tracks previous work done on items for warranty purposes, etc. • Stock Control Link Reports on stock (such as spare parts) used and serial/batch numbers for each job. Enhanced serial number tracking options are available. Full support for stock kits and non- diminishing items. • Expense Costing Calculates costs based on time, materials and expenses such as sublet repair charges/contact work, delivery fees, etc. • Service Invoices Job cards may have a different invoice style from regular invoices. • Periodic Billing Completed jobs may be invoiced once or an unlimited number of times. • Cost Overrun Tracking Job and charge estimates may be entered in jobs. Overruns are highlighted in red. • Copy Jobs Old jobs may be copied into new jobs. Full details or address details with or without note information may be included. • Stage Allocation Up to 9999 stages per job with option to invoice or cost by stage. • Transfer Quotes/Orders Information from existing quotations or sales orders may be loaded into jobs without retyping. • Job Quotes Jobs may be raised as quotes and converted into an active job at any time. • Purchase Link When job related purchase order items arrive they may be optionally transferred directly into waiting jobs. • Reopen Closed Jobs Jobs that have been closed may be reopened. • Pre-Defined Charges Up to 4000 time/labour rates may be set. • Discount Codes Fully linked to Customer Special Pricing. Agreed pricing or general discounts on spare parts may be assigned. The discount rate may be altered by individual job. • Billable Hours Tracks hours used versus hours billed. • Travel Time Can maintain travel charge/rate as separate from service rate. • Note Pads Unlimited length note information can be maintained for each job. Notes are automatically date/time/user stamped & are visually spell checked. • Card File Link Invoices may be generated from Card Files and linked to jobs. Ideal for task/project costing for training/seminar course management, etc. • Unpaid Job Warning Searches for previous unpaid work and warns when entering new jobs. • Track Expense by Activity Contractor work and expenses can be tracked by cost centre/activity. • Standard Charges Up to 10 user charges may be assigned per job. • Track Cost by Activity Staff activity codes may be assigned to work performed. Up to 4000 activities may be defined. Service Manager supports an unlimited number of job cards and can maintain an unlimited transaction history of each. The system is integrated with scheduling, stock control, invoicing, purchasing, back ordering, sales ordering, quoting, serial & batch number tracking and other accounting functions. Ideal for service work, repair, maintenance, field service and project management. Record labour time, expenses (out plant), materials and spare parts used, and other charges and fees. Visual design tools let you customise job cards to suite your exact needs. Remove information you don’t want and add your own, including lists and images. 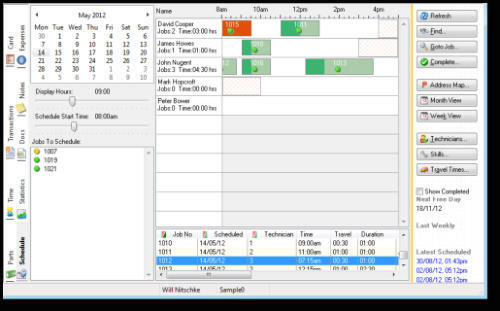 Up to six screens of information can be added to each job. Jobs may be scheduled by dragging them onto the technician calendar. Rebook jobs by dragging the job onto a different technician’s schedule or shift into a different time period with your mouse. Booking clashes are highlighted in red. View daily bookings on Day Calendar or view all bookings on the main system calendar in week or month presentation format. Define travel time based on state or postcode, or create ‘travel zones’ or allow Google Maps to calculate travel time automatically if available. Travel time component visually represented by colour shading a portion of the booking on the calendar. Rosters for technician by day of week, start and end work days and break or unavailability periods in- between. Specify overtime and absentee periods for individual technicians. Define holiday periods for the entire business. Specify skill sets for technicians and skill requirements for jobs, ensuring technicians can perform specified work. Optionally email or SMS job details to tech’s in the field. Numerous billing options include:  Itemise time/labour (or summarise).  Itemise stock/materials (or summarise).  By specified due dates.  Produce overall total only.  Invoice all open jobs, tagged jobs or selected job only.  Invoice a specified stage only.  Invoice a specified customer category only.  Allow inspection/editing of invoice before acceptance.  Transfer work note information onto invoices.  Repeatedly bill a service or stock item with each invoice.  List & inspect all prior invoicing & ‘zoom’ on details. The job card screen (and related printed forms) may be fully customised. Up to 6 screens of service information may be maintained per job. Users may add additional (special) field information to the standard screen. Special fields may also be searched and included on printed forms. Produces a quote or ‘job received’ form. May contain conditions of work or custom messages and may be fully customised using visual design tools. Link images, documents, and external files to jobs. Each job list may have a user configurable selection of columns. An unlimited number of lists may be created and filtered by a variety of criteria. Hide or prevent editing of any field (such as charges or on-hold status) or prevent viewing of the account, subject to the user's security level. Depending on the edition of CAPITAL running, jobs may be selectively hidden from view. For example, department ‘A’ cannot view the jobs of department ‘B’. Access levels & user profile can restrict operator access to profit/cost information. The job file can be loaded into most popular spreadsheets such as Excel and OpenOffice, databases such as Access and word processors such as Word. Mail merging with Microsoft Word, or linking to external applications. Unlimited delivery or contact addresses per job. Management reports on labour, materials & estimated profits including margins. Reports by entered criteria, such as job number range, date range, incomplete jobs, work in progress, account code, priority (marked) jobs, overdue jobs, etc. Estimated Costs Versus Actual Costs report. Cost Centre (Activity) Analysis. Jobs Linked To Unpaid Invoices Report. Staff Time Analysis Reporting. Sort by charges per hour, cost per hour, employee code, hours worked & highest profits.